Since December of 1999, Bosque del Cabo has been proud to offer our tree platform as an exciting addition to our lodge. 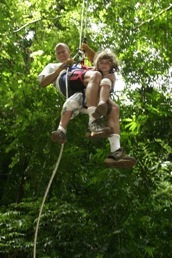 This exhilarating adventure begins when you are suited up in a harness, gloves & helmet, and connected to a pulley that will allow you to zoom through the rainforest on a 250 foot steel cable zip line! This thrilling ride gives you the sensation of flying through the trees. 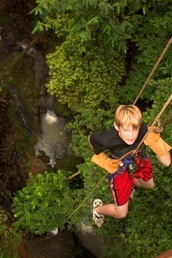 The zip line will gently deposit you right onto the deck of the tree platform, which is situated 110+ feet up in an enormous Manu tree growing next to the banks of the creek behind the lodge. 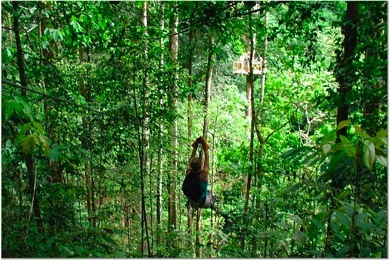 You will be able to view the forest in a completely different way, as you observe the canopy layer of the rainforest. You may catch an eye-to-eye view of a monkey troop passing through the branches, you may see up close one of the beautiful air orchids (epiphytes) that grow only in the tops of the huge, old-growth trees, or you could catch an anteater napping in the fork of a tall tree.